This article deals with one of the most common decorative motifs to be found on beer steins, that of King Gambrinus, King of Beer. The first part of the article provides a glimpse of some of the history surrounding this character, while the second part tells the story of how Gambrinus and the devil formed a pact which led to the creation of beer. 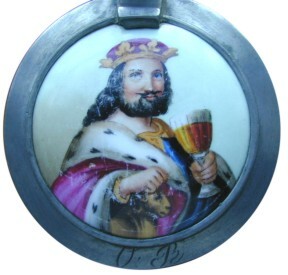 One of the most commonly found decorations on old beer steins is a stout bearded figure with a crown on his head. Frequently seen astride a barrel of beer, he is also found leading parades or simply raising an over-flowing goblet or stein of beer in a toast to those who enjoy his brew. This is Gambrinus, King of Beer. While there is evidence that the Mesopotamians enjoyed an early form of beer at least 6,000 years ago, the first use of hops to flavor the brew is sometimes attributed to the Brabant monks of Belgium. George Ehret, a New York City brewer, published the book, Twenty-Five Years of Brewing, which included the following account: "While some attribute the invention of hopped malt-beer to Jan Primus (John I), a scion of the stock of Burgundy princes, who lived about the year 1251, others ascribe it to Jean Sans Peur (1371-1419), otherwise known as Ganbrivius. A corruption of either name may plausibly be shown to have resulted in the present name of the King of Beer, viz., Gambrinus, who we are accustomed to see represented in the habit of a knight of the middle-ages, with the occasional addition of a crown. Popular imagination, it seems, attached such great importance to beer, that in according the honor of its invention, it could not be satisfied with anything less than a king." When we discover that Jan Primus of Brabant was a noted warrior and local hero with prodigious beer-drinking capacity, we are further encouraged to believe that he is the Gambrinus of popular legend. President of the Brussels Guild of Brewers in the late 13th century, Jan Primus is said to have drunk 72 quarts of beer at one sitting! 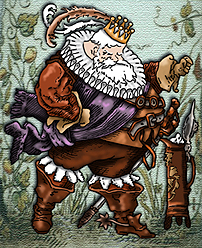 It's no wonder that he is the hero of brewers everywhere, and that the image of King Gambrinus has been used by countless brewers as a means of "branding" their product. (Thanks go to the web site of Avignon, Provence, France, and to the Gambrinus Pub, for permission to use this edited version of the tale appearing on that site (www.avignon-et-provence.com.)). 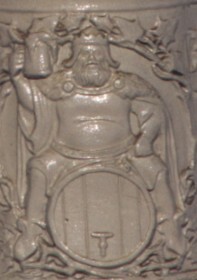 This is perhaps the most common portrayal of King Gambrinus, his robe about his shoulders, crown atop his head, stein hoisted in salute, and sitting astride a barrel of his favorite liquid! It is Gambrinus who created beer, and we will tell you how he did that and how he became King. Gambrinus was a poor novice glassmaker from a little town in Flanders, Fresne sur l'Escaut. With his wonderful pink cheeks, his blond hair and blond beard, he was the most beautiful boy in the town (and he had a lot of success with the girls). In his work Gambrinus prepared glass for his master, who had the skill and the exclusive right to blow the glass into different forms. Everything could have been very simple for him, but he fell in love with Flandrine, his master's daughter. At last, Gambrinus told Flandrine about his feelings. As proud as she was pretty, Flandrine wanted to marry a master like her father, grandfather or even her great-grandfather. But in these times the glassmakers, noble from birth, taught their art only to their sons, so Gambrinus had no hope of becoming a master. The girl refused Gambrinus so strongly that he decided to leave the glassworks to learn how to play violin and to become a poet. He was so skilled that he quickly became one of the best in the region. Everybody called him in order to liven up weddings, birthdays and other parties. People from Fresne were amazed at all the things they heard about Gambrinus and they asked him to play for them. When Gambrinus began to play, all the people started to dance and sing. When Gambrinus saw Flandrine enter the room he began to tremble, and he played so badly that the people were annoyed, and they began kicking him and shouting at him. Gambrinus was arrested and spent one month in jail for disturbing the peace. When he was freed, he decided to kill himself in order to forget Flandrine. He went to the forest, and was preparing to hang himself when the devil appeared. As usual, the devil proposed a deal to Gambrinus: if Gambrinus couldn't earn Flandrine's love, the devil would allow Gambrinus to forget her, in return for possession of his soul for 30 years. Gambrinus accepted the deal and his love for Flandrine was replaced by a passion for games. He played again and again at every kind of game. He was very skilled and very lucky, whatever game he played. He rapidly became very rich, but he still had longings for Flandrine. He began to think that since he was now rich like a prince, Flandrine might change her mind. Flandrine's refusal was as clear as the first time - Gambrinus wasn't a noble, he was born as a boy, he will stay a boy for life. Gambrinus returned to the forest in order to finish what the devil had stopped and he met him for the second time. Gambrinus told the devil him that he wasn't living up to his side of the deal, because he was still in love with Flandrine. Suddenly a field appeared in front of him, long lines of poles were raised and in a while they were covered by green plants, strongly perfumed. "It is hops," said the devil, "and the two houses you see there are a hophouse and a brewery. Come on, I will teach you how to make beer, the Flanders' wine, which will help you forget Flandrine." Gambrinus learned how to make beer (not without tasting it and finding it delicious). Then he asked how he could take revenge against the people of this town who kicked him, sent him to jail and broke his violin. The devil proposed to him an instrument which nobody could resist and he taught him how to make and play chimes. Back home, Gambrinus planted the precious seeds given by Beelzebub, and made beer and chimes. One morning he set up tables, chairs, barrels and chimes on the main square of the town and he invited all the people to join him in order to taste his beer. When the the townspeople tasted this new drink, sometimes brown or lager, the said "it is bitter", "it is strong", and there were a lot of complaints everywhere. People were laughing and joking about Gambrinus when he started to play chimes, and suddenly all the people started to dance. After an hour they wanted Gambrinus to stop, but instead he played on for hours. At last he stopped, thinking that he had his revenge, and the thirsty revelers began to drink his brew. They quickly changed their minds, and decided that this beer was the best drink they had ever drunk. His success spread far and wide. Everywhere he planted hops, brewed beer and played chimes. The Flanders King, in order to thank him, offered to make Gambrinus duke, count and lord, but Gambrinus preferred the title of King of Beer, as he was known by the residents of Fresne. When Flandrine understood that Gambrinus would never come to her again she came to talk to him, but Gambrinus didn't recognize her, and offered her some beer to drink. He had forgotten her. Gambrinus lived happily with his subjects for 30 years, when the devil came again. But instead of following him, Gambrinus started to play chimes and the devil began to dance. Gambrinus played on and on, and the devil couldn't stop dancing, so that finally the devil begged him to stop and agreed to break the deal. After that Gambrinus lived happily playing chimes and making beer. When he died, we found at his place a beer barrel, and that is why he doesn't have a tombstone.